Is Clos killing UN Habitat? I’m recovering from the third PrepCom for Habitat III held in Surabaya. If you are not aware of where Surabaya is, it is an industrial city in Indonesia a little below Jakarta. Not somewhere that is on many people’s tourist plans. I have to say as always the Indonesian people were amazing and the entertainment on the first night spectacular. Guest blog by Aldo Caliari Rethinking Bretton Woods Project Director Aldo Caliari writes on the Outcome of the XIV UNCTAD Conference.Republished from the Center for Concern website. Due to UNCTAD's decidedly pro-South and uncompromising development-focused mission, its quadrennial conferences have traditionally been North –South showdowns. Coming a few months after the adoption of the ambitious and universal 2030 Agenda for Sustainable Development and its 17 associated goals, the theme of the XIV Quadrennial Conference of UNCTAD (the United Nations Conference on Trade and Development) was “From Decisions to Actions.” There was, therefore, reason to expect that this time members would bridge their differences for the sake of reinforcing mandates of the organization critical to the Agenda’s implementation. But that was not the case, and the dynamics were a lot more akin to the difficult ones witnessed in the inaugural Financing for Development (FFD) Forum last April. 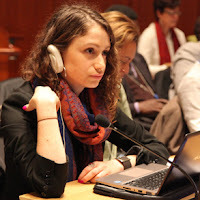 Alexandra Tohme is an independent journalist and program coordinator at The Lebanese Center for Policy Studies in Beirut. The impending siege of Aleppo will have horrific ramifications for Syria, the region and global security. If the current U.S. policy in Syria does not change, the war-torn country risks falling into the hands of both Assad's regime and the Islamic State group. 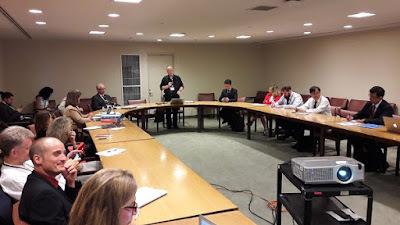 Guest blog by Anne-Sophie Stevance ICSU Science Officer The annual session of the High-Level Political Forum (HLPF), the deliberating body for sustainable development at the UN, took place in New York from 11-20 July. The International Council for Science led an 8-person scientific delegation to the event, and was an active participant in several events during the week. As my readers know I have and am a strong supporter that the next UN Secretary General should be a woman and I also support regional rotation. We have to remember that this is decided by the 15 members of the UN Security Council who may work by different criteria than the rest of us. There is no veto in this round by the Permanent Members of the Security Council - the P5 - all the papers of the same color and ask Member states to put their mark against three options encourage, dis-encourage and no opinion. Was I surprised that Former Portuguese Prime Minister Antonio Guterres (12 encourage, 0 dis-encourage and 3 no opinion) top the first poll and is now considered by the media as the front runner to be the next United Nations secretary-general, perhaps not. 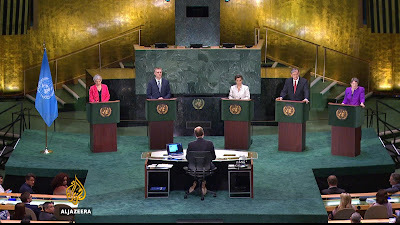 On Tuesday the 12th of July the candidates for the next United Nations Secretary General were debating in the UN General Assembly Hall which was excellently moderated by Al Jazeera's James Bays and Folly Bah Thibault. The first thing to say about the debate is that ALL the candidates performed well and conveyed strong leadership capabilities needed for the next Secretary General. The debate was so much more refreshing than the US Democratic and Republican debates for President, and gives hope that there are still among us true leaders. While the scientific community has emphasized the need for a systems approach to sustainable development, scientists, like policy-makers, are now facing the challenge of turning the goals into reality. 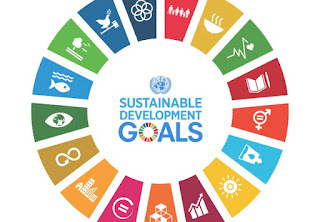 Recognizing the integrated, indivisible nature of the Agenda 2030, the International Council for Science, with its research partners, is exploring an integrated and strategic approach to the implementation of the SDGs, aiming to create a common conceptual framework to help policymakers and investors identify and manage synergies and tradeoffs across goals and targets. The side event will present the framework, which is a seven point scale, and explore with policy makers from both developed and developing countries the challenges and knowledge gaps they face in the implementation of the SDGs. On Tuesday the 12th of July in Room A 1:15pm to 2:30pm there will be a side event ‘Water – Food – Energy - Climate Nexus’ The event will have authors from the recently published book ‘The Water, Food, Energy and Climate Nexus.’ Global trends of population growth, rising living standards and the rapidly increasing urbanized world are increasing the demand on water, food and energy. Added to this is the growing threat of climate change which will have huge impacts on water and food availability. It is increasingly clear that there is no place in an interlinked world for isolated solutions aimed at just one sector. In recent years the "nexus" has emerged as a powerful concept to capture these inter-linkages of resources and is now a key feature of policy-making. 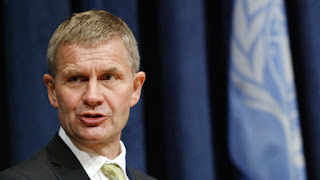 UN’s former climate change chief, who was a key architect of the Paris climate agreement, joins the list of candidates to succeed Ban Ki-moon. She was nominated by the president Luis Guillermo Solís of Costa Rica. As someone who did not support the Iraqi war without a second resolution in the UN Security Council then Sir John Chilcot’s inquiry has shown how right that position was. The above is the position taken by Charles Kennedy the then Liberal Democrat Leader in the UK against entry into war with Iraqi. He wasn't the only voice against there were politicians on the Labour and Conservative side who also raised there concerns. But he was the only national party leader in parliament to oppose. So what are key findings. If you haven't read them elsewhere then let me share them with you. 1.What would you say is your vision for UNEP?